My drawing for the letter K bombed, so … see if you recognize this man. His is one of the first portraits I did. I think the photo reference was fairly recent. He’s a British actor who’s played in lots of films here in the US. I’ll be curious if anyone recognizes him. The next few weeks will be really busy for me in the office, so I will keep posting, but not sure how many will be portraits…. < J is for … ? I like the drawing, but I’ve no clue. You’re not alone. There’s a reason I never posted this. Although Ann guessed correctly. I’m holding her guess in moderation. His eyes really grab my attention. What is it they say about a persons eyes? Aren’t they the window to their soul? You have done a wonderful portrait here. Aww thanks! And it’s so weird because when I was younger, I used to really struggle with eyes of people and of animals, but now that I haven’t been doing any kind of art for 30 years, all the sudden I seem to be able to get the eyes even if I don’t get the rest of the thing. It’s really strange but I do like it. Post-meno benefits? I guess there have to be a few lol. Thank you very much. You mean there are benefits to post-meno? I’m still looking for them or maybe I just can’t remember what they are! LOL! haha! Another benefit! Memory loss. Oh, it’s so wonderful. Why didn’t we appreciate those $%^& things when we had them? I used to wish it away. And I got my wish! Early meno. Oh, the joys lol. I’m guessing this is not a “K” drawing as I clearly see Alan Rickman. Thanks, Frank, you guessed it! My drawing for the K bombed on me, so I pulled one out that I had done several weeks back that I wasn’t really happy with instead. I’m glad you saw the likeness. I wasn’t getting a lot of correct guesses from most of the people I showed it to prior to posting here. I didn’t know his name, but I recognized him. Sorry to come late to the game today – early morning work meetings and all day! Another awesome drawing!!! You rock Laura! This portrait looks like Alan Rickman, but I believe he’s Australian. Very lean, intense look, and I like it. I hope your busy office work won’t jerk you too far out of the sphere of art. I’m always disgusted when I let my job do that to me. It is Rickman, and thanks! Oops, didn’t know he’s Australian. This is the reason I started this blog in January. I was determined not to let work interfere with my passion. It’s worked, so far. Sometimes I’m up much too late, but in the end I usually wind up with more energy, not less, so it’s all good. It took me til age 46 to find out art is necessary for my health. It’s crazy, but now that I know, I’m not letting it go. I’m really proud for you, that you found your Center. Thank you! Me too. And relieved. It’s been a long seek and find. I see I’m late to the party here…very nice lines in this one. Very expressive. Thank you. This was one of the first. I think I’m going to try this again in my next attempt. I prefer it, but it’s not as easy for me to get a likeness as when I tickle the color onto the page. Alan Rickman was the first one I thought of. Nice! I’m way late to the part on this one. I saw it yesterday and guessed it straight away though, just went to bed instead of commenting. 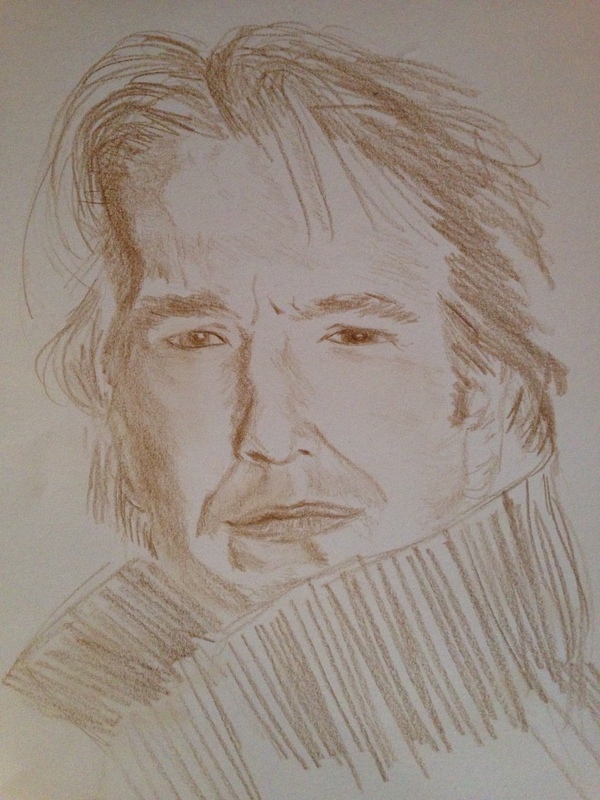 I think it’s a great likeness to Alan Rickman though. I just wanted to point out that all you had to do was add a beard and you could have called it a K drawing after all! Hans Krüger from Die Hard was the first name I thought of when I saw it. I think I tend to get very hung up on the letters and my brain only accepts names that match your daily letters when it’s searching for facial matches. Oh, you’re so right!!! Hehe! I’m glad so many people recognized him. He was fun to draw. Expressive faces are cool. (And easier to guess, which is why I pick them.) Thanks so much for your comment. Thank you! I really enjoy doing them. very nice. you have a way with portraits. I always recognize the people, although I couldn’t pull out Snape/Alan Rickman’s name from my addled brain. Lol thanks! I really enjoy them.